Gear. So much gear. So little time…. This new picture was taken January 7th, 2018. Things keep changing though, so who knows how it will look tomorrow. Shelves were a great idea! Not perfect but a lot cheaper than really expensive keyboard stands. I have instant access to a lot more keyboards now and still have more space in my small room. Unfortunately it filled up my mixer inputs so I had t get out my old Soundcraft Rack Pack 14 channel mixer to take some of the overflow. The Eurorack Modular System has grown up over the last few years. I still remember when it was just one box, not even full! Now with the recent additions of a sweet sounding Aion Modular 904a filter, the Roland 521 dual filter, and now the Boomstar SE88 it’s very versatile and the source of many awesome sounds! And the Tom Oberheim SEM-Pro is still an amazing synth in it’s own right! Absolutely irreplaceable. Although the Korg MS-20mini is no slouch either. And the MS-10 is really warm and smooth sounding. The latest is this 1975 Micromoog. Beautiful sounding synth!! Very smooth filter, great for bass, and loads of features even though it looks very simple. It’s amazing how great sounding the one-oscillator synths are. 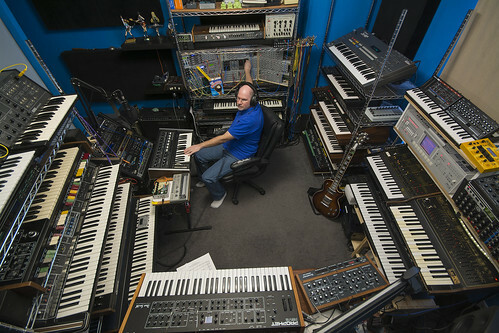 The Micromoog, Korg MS-10 and Arp Axxe are my favorites. The old Yamaha CS-10, not so much! Also on that shelf is another one of my favorites, the Roland SH-2. This is definitely one of the fattest sounding synths I own and it get’s use more and more. The Yamaha SK-20 is one of my favorites now. I love those 70s string machine sounds. I also have an old Elka Rhapsody 490 and an Arp Quartet. Those old synths have such a big fat sound!! That back corner shelf is almost exclusively Yamaha now. From the bottom, above the Soundcraft Rackpack mixer is a DX-7II, SK-20, CS-40m and a CS-15 going through an Effectron II digital delay. Above that is the Ensonic ESQ-1 for now, but it may be replaced with the Sequential Circuits Sixtrak since it has a very cool, fat analog sound. There’s also an Arturia Microbrute stored there for now. Cool little synth with a unique metallic sound. time so I kept that one separate. And in front of me on the desk is the DSI Prophet 12, acting mostly as a master keyboard but occasionally I use one of the sounds I’ve programmed into it. I also have Fender American Standard Telecaster, Fender Jazz Bass, Geddy Lee Edition, a Peavey Wolfgang and a 1976 Gibson Marauder and other guitars that aren’t getting a lot of use these days.